Premium cutting board material features a pebbled self-healing surface that preserves cutting blades. Used widely in industrial and retail food processing operations. 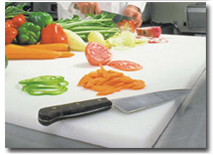 Cutting board is used in stores, homes and manufacturing plants.